Lola can't remember the island where she was born but her abuela tells her, "Just because you don't remember a place, doesn't mean it's not in you." 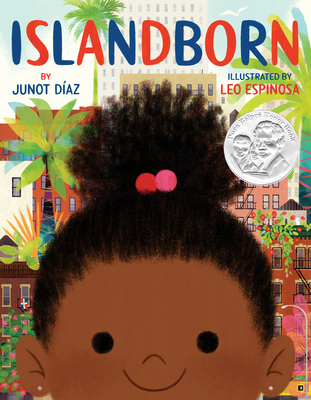 Beautiful and amazing, this picturebook about family, community, and birthplace is just what I would expect from Junot Diaz -- brilliant in every way. Gloriously illustrated and lyrically written, Islandborn is a celebration of creativity, diversity, and our imagination's boundless ability to connect us—to our families, to our past and to ourselves. Junot Díaz was born in the Dominican Republic and raised in New Jersey. He is the author of the critically acclaimed Drown; The Brief Wondrous Life of Oscar Wao, which won the 2008 Pulitzer Prize and the National Book Critics Circle Award; and This Is How You Lose Her, a New York Times bestseller and National Book Award finalist. A graduate of Rutgers University, Díaz is currently the fiction editor at Boston Review and the Rudge and Nancy Allen Professor of Writing at the Massachusetts Institute of Technology. Leo Espinosa is an award-winning illustrator and designer from Bogotá, Colombia, whose work has been featured in The New Yorker, Wired, Esquire, The New York Times, The Atlantic, and more. Leo's illustrations have been recognized by American Illustration, Communication Arts, Pictoplasma, 3x3, and the Society of Illustrators. Leo lives with his family in Salt Lake City, Utah.